William Andrew Wilson was the son of the Rev. A. J. Wilson, D.D. He was born in May 1869 in Minterburn Manse in County Tyrone. William Wilson was educated at Queen’s College Belfast. He then went to Assembly’s College, Edinburgh and then to New College, Edinburgh. He obtained the degrees of B.A and M.A. at the Royal University of Ireland and on completion of his course was licensed by the Belfast Presbytery in May 1894. 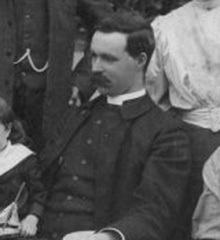 The Rev William Andrew Wilson was the Presbyterian Minister of New Row Presbyterian Church, Coleraine. 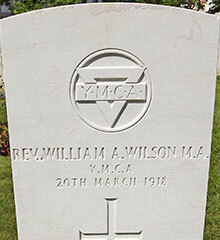 The Rev William Andrew Wilson was killed in a motor accident in Paris on 20th March 1918. Ste. Marie Cemetery is one of the town cemeteries, but it is actually situated in the commune of Graville-St. Honorine, overlooking Le Havre from the north. The main entrance to the cemetery is on the Rue du 329ème Régiment d'Infanterie. There is another entrance on the west side of the cemetery which is closest to the main war graves plots and this can be accessed via the Rue Eugène Landoas.